Give your pet a hand in helping to maintain proper dental hygiene. This fingerbrush will help whiten and brighten your pet's pearly whites! 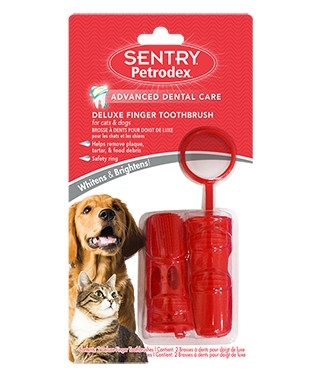 The SENTRY Petrodex Deluxe Finger Brush is an easy-to-use finger toothbrush for dogs and cats that helps to remove plaque, tartar and food debris while massaging gums. It is gentle, flexible and has an added safety ring for security while using. The long length of the finger brush fits over your knuckle, and it is even dishwasher safe. The Deluxe Finger Brush is ideal for use on puppies and kittens, but also comes in handy for adult pets as well.